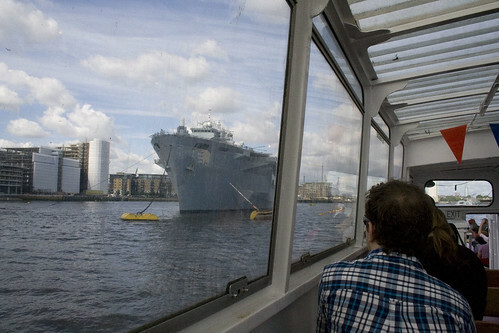 On Friday evening, the Royal Navy’s largest ship, HMS Ocean squeezed its way through the gaps in the Thames Barrier and moored by Greenwich for a few weeks of securing the area for the Olympics — and on Sunday let us non-military sorts have a look around a bit of it. 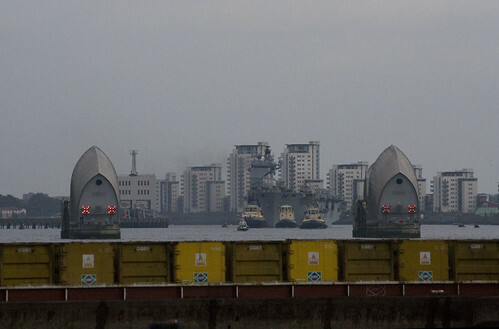 A big ship squeezing through the Thames Barrier is always going to be interesting, so I trotted over to watch. A plan to catch the last Cable Car pod across before it closed to let the ship through was abandoned when I arrived and a wander round suggested I might get a better vantage point from the foreshore. Alas, as it approached, the ship seemed to be taking the one gap in the Barrier that was obscured by a floating pontoon, so a quick run over to the nearby kids playground which I had already checked offered an alternative view. The floating rubbish cargo containers from the City of London almost making photos equally rubbish, but just keeping out of the way. Fortunately, a local resident in the block of flats behind shouted down an invite to his 2nd floor terrace, which was swiftly accepted and a trot around the building for a much better view of the leviathan being nudged through the gaps. It actually looked as if the ship was going to hit the barrier at one point, thanks to the sharp angle of approach and the tugs being almost squashed up at one side. 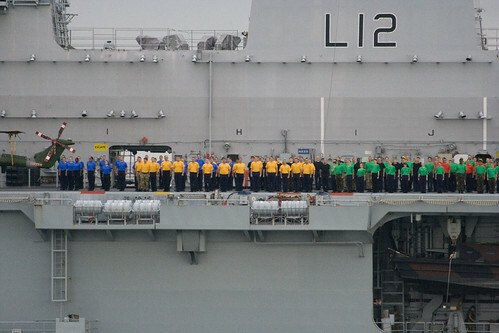 As the ship passed, it was clear that the sailors were up on top in very not at all sailor type clothing – and it later turned out they were forming the Olympic rings if seen from above. Under the new Cable Car, which for safety had no passengers on board at the time, and then after being spun around, dragged backwards down to Greenwich. I wasn’t sure of my plans, but cancelled overnight photo shooting meant I was able to trot down to Greenwich early to have a look around the ship which was being opened for the public to see inside. Warships generate their own power, so even at rest the engines inside are still rumbling away, which might be an irritant in the future for people who may end up living in the blocks of flats that are being constructed right next to the mooring point. Or maybe they will look upon the arrival of a big ship as one of the perks of riverside living. I know I would. An hour long wait, appropriately next to the statue of Sir Walter Raleigh and then through the security tent, which looked remarkably like the one I passed through a few years ago for another carrier tour. Walking then unescorted to the pier to catch a boat it was theoretically possible that a miscreant could have joined the queue – but I am sure they would have been kicked out by those of us who had queued. Brits do not approve of queue jumping! A Thames tourist boat was our transport link of choice, and lucky ones got to sit outside, and the rest of us inside to try and photograph the ship through dirty glass. Rather nicely I thought, the boat took the long way round the steel monster, but then had difficulty mooring up next to it on the other side. Not sure what the problem was with the mooring point, but a pair of pliers wielded by one of the officers seemed to fix the problem. Up the traditionally very steep folding steps. 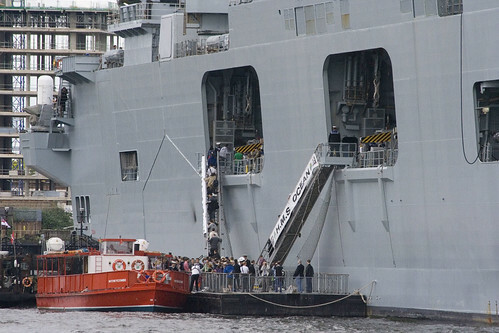 There had been a warning before that those who prefer lifts and escalators might find a warship less than friendly. 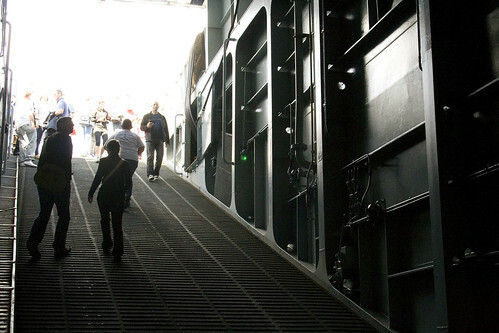 And into a small hanger space with an alluring ramp up to the main deck, but sadly at the top a rope was holding people back. Also, quite a few people seemed to linger rather longer than the view of the top deck seemed to warrant, which made the wait to snap a photo and get out of the way for the next person somewhat irksome. No worries I thought, they’re probably letting people up on deck at the other end. Inside the bay below, kids were able to get camouflage paint on their faces, including as I noticed later some adults. Do try the army rations. Again for the kids, please jump around the inflatable raft on display. A gap in the white mesh covers indicated a route around the rest of the ship, including a chance to see up close and attached to the side one of the amphibious assault craft that I see zooming past my flat – usually rarely, but at the moment, quite often. that closest flag is actually upside down. Tsk! Then through into the main hanger space – which is vast. It is difficult to convey just how huge the area is, especially as part of it was sealed off yet there was plenty of space to move around. 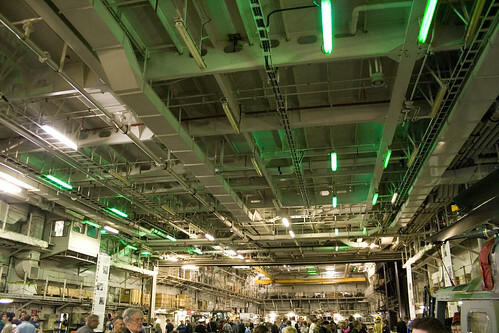 Also with the exception of the space for the two large lifts, it is completely unobstructed, which makes for a significant change from the UK’s older Aircraft Carriers which seem almost cramped by comparison. 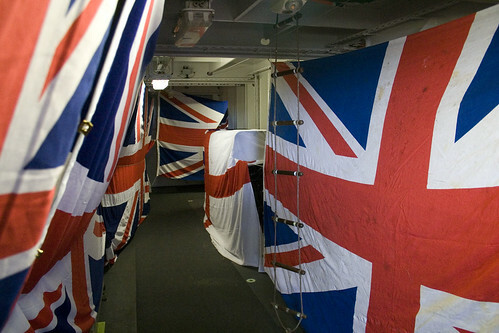 Lots of displays around the edges showing off the ancillary support services that keep the ship working so that it can deliver the military fire-power to wherever our elected masters declare it should be so delivered. As an ex-first aider, I was quite curious about one of the older looking stretchers they had on display. I recognised the clamp stretcher for back injuries, and the rest looked normal, but one tired old cloth stretcher was new to me. And it is modern. A person in need could be strapped in like a straight jacket, then hoisted up vertically instead of carried horizontally. Obvious once it was explained! A couple of helicopters were inside, the rest being up on deck. The overall impression inside was a chance to gawp at the structure and for parents to let their children get excited about serving in the military or join up as cadets. 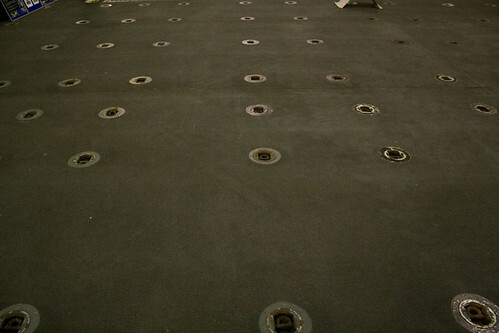 The floor was also covered in recessed hooks, which are there to allow items to be strapped to the floor to stop them rolling around the place. Made for a slightly hypnotic display. Up a flight of stairs to follow the advised route and it was clear that this was the end of the tour. One group of visitors behind me realised and ducked back down into the hanger. 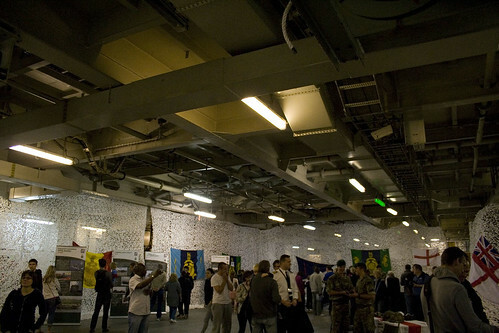 Sadly no chance to go up on deck, which was explained to me due to the security curtain having come into effect now for the Olympics, so the flight deck is an active military space and helicopters might be needed at a moments notice. A pity as I was hoping to get a better impression of the width of the flight deck, but I am sure my imagination can fill in the gaps. And it was a rare chance to look around what unescorted people could be allowed to see, so no complaints there. Departing the ferry boat captain said that our next destination would be the Falklands, to sort out a little bit of bother down there. To much amusement of the passengers. As I left, another boat arrived to disgorge more visitors, and would continue to do so until 3pm that afternoon. Given that I live in the shadow of the OIympic Park I’ve been getting quite nervous about the huge military presence at the Games. I’m glad I went yesterday – I feel a bit more reassured, and the ‘security machine’ has started to gain a human face. The flight deck also had no barriers at the edge, which would have made it hazardous for the general public, and would have scared the crap out of me. I have to admit I expected the Navy’s biggest ship to be a lot bigger than it was. They let people up on deck last time she was in Greenwich, and I have been on an aircraft carrier that you could – if so inclined, have fallen off the edge. If someone can’t work out that jumping off the edge of a ship is a bad idea, then darwinism can deal with them. Great shot of the hanger, impressive! Regarding “the Royal Navy’s largest ship”. 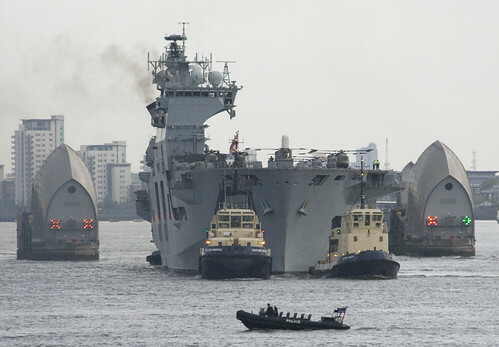 I see from Wikipedia that HMS Ocean is 21,500 tonnes. Apparently the first aircraft carrier being assembled in Rosyth is already heavier than that and only one third complete.